Analyses Options with MONICOR - 1543934757s Webseite! 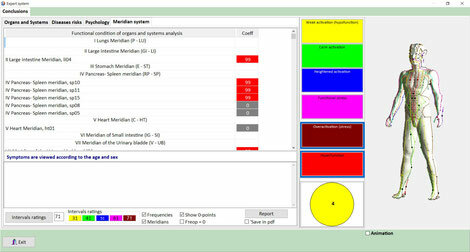 MONICOR offers a variety of different analysis options, which are explained in more detail on this page. 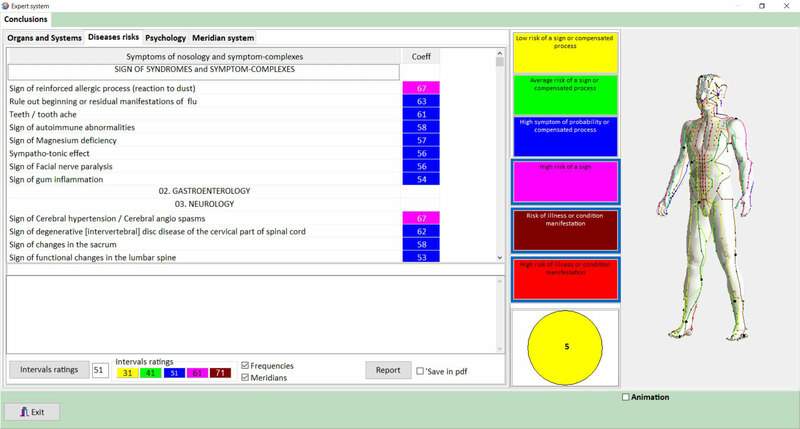 After a measurement you automatically get the values of the meridians, shown in a clock system. 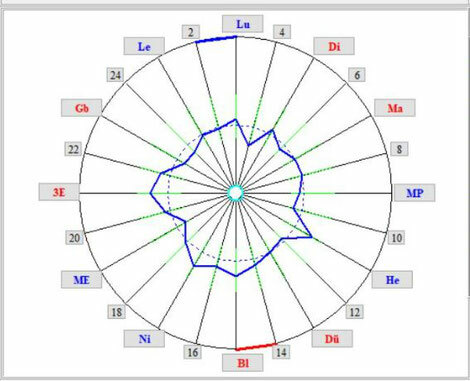 Here is a first overview of which meridians there may be actual deviations from the rest. By clicking on the corresponding letters and numbers on the outer ring, there is background information on the corresponding meridian including the active times. With another function you can also display a distribution on the cerebral hemispheres. This may be important as disturbances may occur only in certain areas, so that you can get first impressions from the pictorial representation alone. Furthermore, MONITOR shows an integrated valuation on this page. 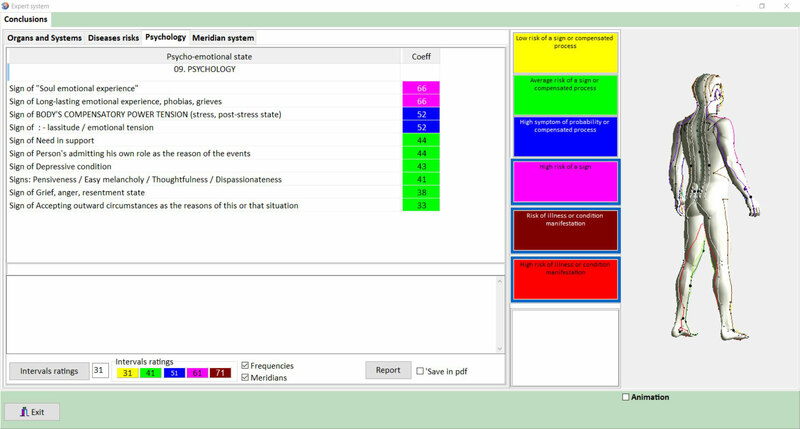 Here, the relationship of sympathetic to parasympathetic systems are displayed, such as the vegetative-emotional tone and the psycho-emotional status. By coloured underlay of the appropriate parameters, the user is already given a first impression. 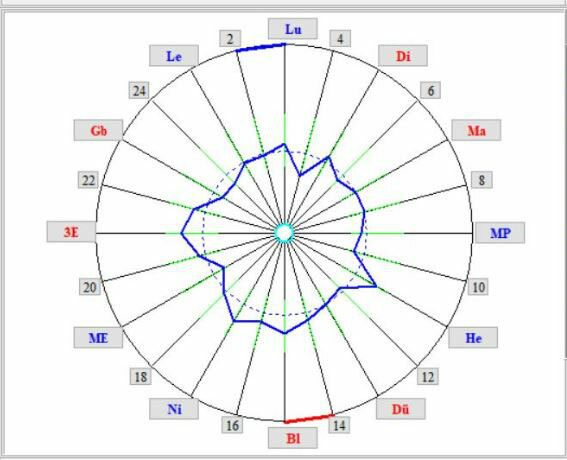 MONICOR displays the biorhythms of the subject, if the corresponding function is activated. Thus, it may already be a first impression, which parameters of the biorhythm are currently pronounced or rather weaker. This helps to better understand and interpret the other values. Again, this is ultimately a puzzle stone to analyze the subject in its entirety. Unter diesem Oberbegriff verbergen sich diverse Einzelanalysen, die letztlich insgesamt zu einem Rundumbild der Testperson führen sollten.This generic term conceals various individual analyzes, which should at least as a whole lead to a total image of the subject. Specifically, these analyses are: organs and systems, risks of disease, psychology and the identification of acupuncture points. This will be shown below. 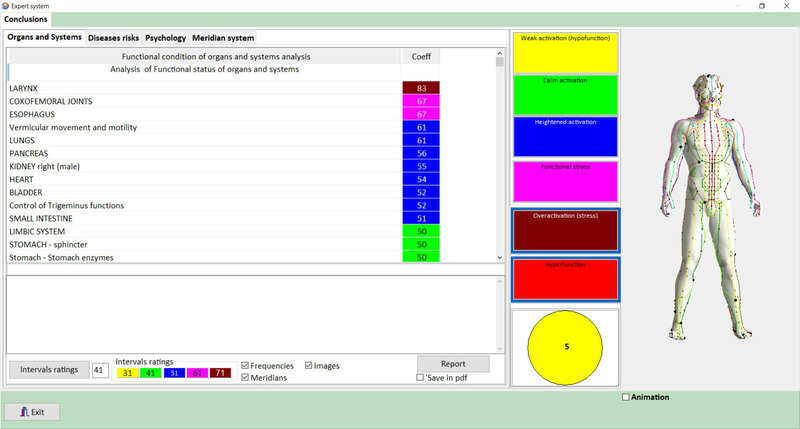 As seen in the picture next door, MONICOR arranges the organs and systems in an order according to stress parameters, with the most stressed at the top, the less stressed at the bottom. To keep track, you also have the ability to hide certain sequences, so you can concentrate on the essentials. It should be noted that this is always the momentary state of the subject. If this has e.g. has eaten just before the measurement, so the stomach shall be highly likely loaded (stressed). In order to hide such factors, MONICOR offers the possibility to carry out these analyzes summarized from several tests. This makes it easy to identify which organs and systems are constantly causing problems, and where stress or significant stress comes from previous actions (e.g. food, exercise, external stress from work or the like, etc.). All in all, more than 50 organs and systems are identified and stress-rated under this point. MONICOR offers the possibility to enter your own comments on each individual organ or system. So you could, for example note that a particular drug is taken by the subject or just a special, not always present situation exists. By this way it is understandable at a later date too, at any time. On the basis of the existing measurement results, MONICOR assesses the risks of various diseases and evaluates this risk again in a scale. The corresponding list is also structured in such a way that the highest risks are mentioned first, but below the main point are various thematically appropriate areas such as cardiology, pulmonology, etc. summarized. Every point is sorted by probabilities. For reasons of clarity, all illnesses with a lower probability can only be made visible if this is explicitly marked. This makes sense, because otherwise too much information could blur the vision of the essentials. This function can also be used to combine several measurements to obtain an overall picture. Some disorders are characterized by the fact that they lead to fluctuations of syptoms. This is exactly what MONICOR can detect through this summary of several measurements. Since the psychological aspect plays an important role in the overall consideration of a condition, this point is emphasized in MONICOR. Various psychological aspects are listed here, again sorted by the degree to which they apply- But in this field a high percentage does not mean automatically something negative. So it can, as in the example next door, be quite positive to have the stamina to achieve its goals. Again, in this section, it is possible to make individual comments under each sub-item, such as current stress due to special situations or the indication of therapies or medications to be taken etc .. This point shows all acupuncture points that either have too little or too much energy. These are also marked by dots on the graphic shown on the right side. By clicking on the graphic you can enlarge it to get a better view of the points. The graphic can then be rotated, zoomed in, zoomed out and moved so that each point can be reached easily. By clicking on the dots or on the name of the meridian you will get a description that provides a comprehensive overview. 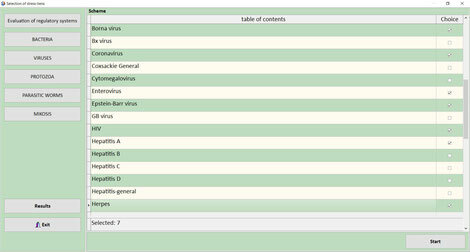 MONICOR displays the Chinese and Japanese names of the point and the corresponding assignment number in the WHO system. Furthermore, you will learn about the related indications, the localization, as well as various acupuncture recipes, so that it should be easy for the acupuncturist with these descriptions to choose the right treatment for the patient. The point heading stress test, leads to the search of pathogens. 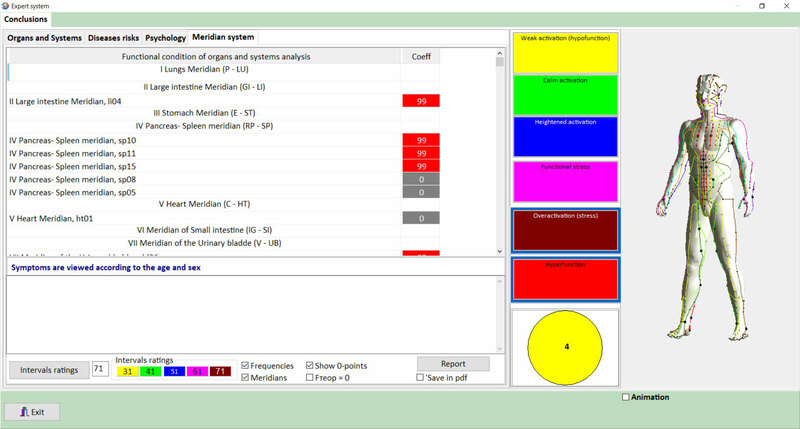 If one has the assumption that certain pathogens are present on the basis of the above-mentioned analyzes and the statements of the test person, MONICOR can be used to search them quickly and easily. One measurement is able to search for up to 10 pathogens. These can be selected from a list specifically for bacteria, viruses, unicellular organisms, parasitic worms and fungi. In the following test, MONICOR specifically checks the frequencies of the selected pathogens to determine how far it resonates, so that the body is currently being stressed by these pathogens. This is displayed graphically in a list with corresponding probabilities. The total analysis takes between 1 and 2 minutes, depending on the number and type of pathogens tested. After that, you not only get clarity about whether the selected pathogens actually stress the subject, but also what exact type is responsible for it at the frequency level, which makes later treatment easier. As mentioned above, MONICOR can also perform analyzes of several selected measurements as a unit. In addition, there is also the possibility to have the images of the individual measurements displayed side by side. This applies to the meridian clock as well as to the efficiency analysis. In addition, the meridians can be graphically displayed in their dynamics. This gives you a quick overview how effective the initiated measures have been.